Marvel films are always shrouded in secrecy but one actor has finally been confirmed for Avengers: Infinity War (2018). Irish actor Tom Vaughan-Lawlor who's best known for his role as Nidge Delaney in the RTÉ One series Love/Hate is in the movie. After behind-the-scenes set photos leaked of him filming with Doctor Strange actor Benedict Cumberbatch, he admitted he wasn't able to confirm the role until now. Talking to Dublin Live he confirmed that he plays a villain in the film. When RTE Radio 1's Second Captains asked if he was in the Avengers sequel he said, "I am. But it’s like I’m one of those ones where you go into a sentence to say something about it and hope you have a job at the end of the sentence. “You sign so many documents and waivers and people ask you about it and you have to give the generic and boring ‘I can’t say too much about it’. "But I am doing it and it’s really amazing and an amazing thing to be part of." While it hasn't been officially confirmed the rumor is he's playing Ebony Maw. Ebony Maw is a member of Thanos' elite squad of alien invaders known as "Black Order". 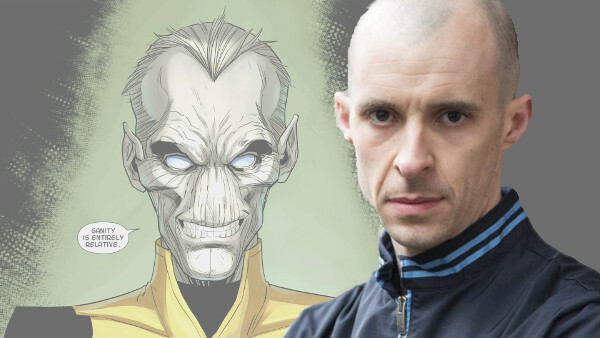 Tom Vaughan-Lawlor's character is highly intelligent and a dangerous thinker of the Mad Titan's army. In the comics, Ebony Maw uses his mind-control abilities to make Doctor Strange help him find the Infinity Crystals for Thanos. Based on the set photo it looks like he'll be doing the same thing in the movie. That or Doctor Strange is a sound sleeper. Also, you'll notice that Vaughan-Lawlor is wearing a motion-capture suit, so it'll be a CGI role. Despite being cast in one of the biggest movies of 2018 he's staying grounded. "Any time you think you’ve in any way ‘arrived’ you need to ask yourself questions about your art and what you perceive yourself to be," he said, "You’ve got to focus on your work and let the rest take care of itself." We'll find out later on, but the cast of Avengers 3 is shaping up nicely! Avengers: Infinity War is scheduled to be released on May 4, 2018 (United States). What do you think of the casting? Are you looking forward to Avengers: Infinity War? We love your comments! But please be mindful of our comment policy when making comments. The payroll alone is probably $250M on this.